One of the biggest trends in kitchen design at the moment is painted kitchens. After the very modern, minimalist gloss kitchens that have been popular for quite a while, the market trend seems to be moving towards a softer, more traditional style and bright white has made way to elegant neutrals including creams, greys and taupes as well as a few more daring shades like heather and charcoal! Shaker kitchens are very popular right now, especially in the ‘on trend’ painted finish. No doubt partly influenced by the huge interest in vintage styling, Shaker kitchens combine the best of the traditional and the modern – softer than the sleek, handle-less doors but less fussy than the very traditional kitchens with lots of detailing. Shaker works extremely well in natural wood but a painted finish allows for a real statement, especially when teamed with complimentary colours in tiles, splashbacks and décor. 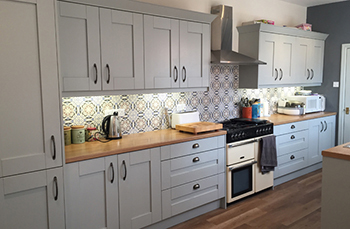 One of our most popular painted kitchen ranges is the Portland, seen here in ‘Mist’ – a soft French grey - teamed with Victorian style tiles as a splashback and oak worktops. It’s also one of our most attractively priced kitchens. Range of colour is obviously a big advantage in a painted kitchen as not only do we offer a standard palate of colours, we can also colour match to order in some ranges so you have the opportunity to create a kitchen that is completely bespoke and created specifically for your scheme. Our new Salcombe range can be produced in the latest Farrow and Ball or Little Greene Paint Company shades. One of the greatest strengths of a painted kitchen is its longevity. Because it boasts elements of both modern and traditional but isn’t making a massive statement in either, it doesn’t seem to date in the same way that very bold statements in either camp can. A painted Shaker kitchen will look as contemporary in 10 or 15 years time as it does now - you may just need to change the décor around it! To request a brochure or see our painted kitchen ranges at our showroom just get in touch. 0 Responses to "Kitchen Trends: Painted Kitchens"